Pote Snitkin was a Skrilling arms dealer who worked for the Hutt crime lord Jabba Desilijic Tiure. 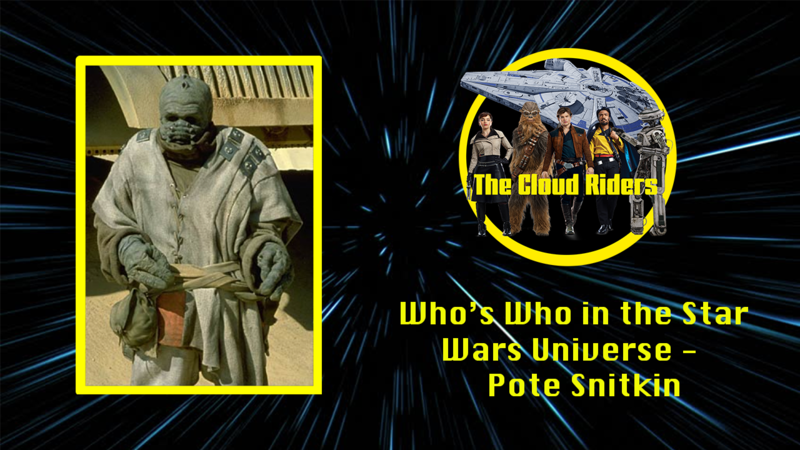 At some point, Pote Snitkin became an arms dealer and later obtained a work as pilot for one of the mutliple skiffes of the Hutt crime lord Jabba Desilijic Tiure. During the Galactic Civil War, Pote Snitkin piloted a skiff full of Jabba’s guards through the dunes of the planet Tatooine to the Great Pit of Carkoon, where the Hutt planned on feeding the Jedi Knight Luke Skywalker and the smugglers Han Solo and Chewbacca to a sarlacc in retaliation of the death of his pet rancor Pateesa. However, at the pit, Skywalker managed to free himself with the help of R2-D2 and slay most of the guards on the skiff he was being held on with his lightsaber. He then boarded Snitkin’s skiff and during the fight that followed, the Skrilling was eventually knocked from the vehicle into the mouth of the sarlacc, to be slowly digested over thousands of years.